A happy and hearty marriage of earthy flavors, brightened by a lively salsa. For salsa verde, soak bread in milk until soft, squeeze excess milk from bread (discard milk) and add to food processor. Add remaining ingredients except oil, process to combine, then add oil in a steady stream, processing to combine. Season to taste, set aside. Heat half the oil in a frying pan over high heat, add radicchio wedges and sear just 30 seconds per side. Remove and set aside. Lower heat to medium, add sausage and cook, breaking up with a spoon, until browned (2-3 minutes), remove from pan and set aside. Add fennel wedges, cook until browned, about 4 minutes total. Set aside. Meanwhile, heat remaining oil in a casserole over medium-high heat, add onion, garlic and fennel seeds and stir occasionally until onion is tender (3-4 minutes). Deglaze with wine, simmer until reduced by half (2-3 minutes), add stock and 750ml water, bring to the simmer. Add lentils, bay leaves and thyme, bring to the boil, then simmer until liquid is absorbed and lentils are tender, 20 to 25 minutes. Add sausage and fennel wedges, simmer until sausage is cooked through (1-2 minutes). Stir through torn radicchio leaves. 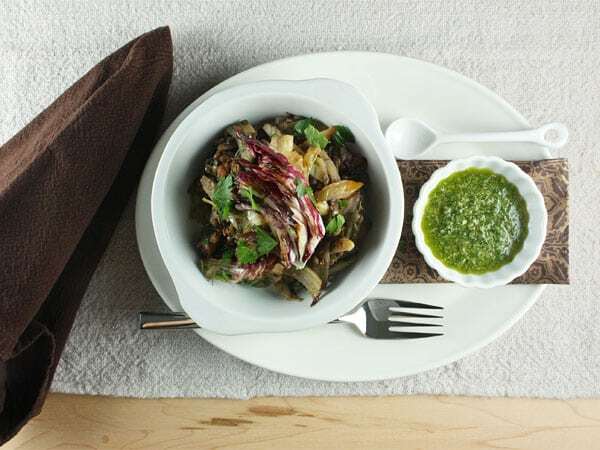 Serve hot in large bowls, topped with one or two radicchio wedges, a sprinkling of parsley and a generous serving of salsa verde.